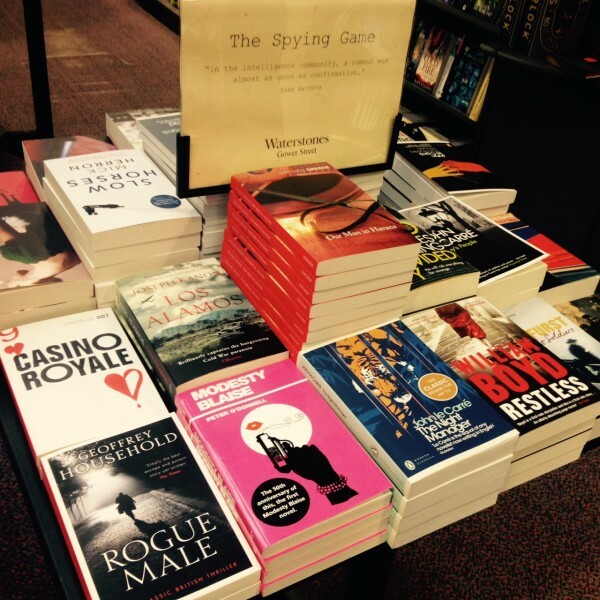 The Gower Street branch of Waterstones is running a Summer of Spies in celebration of spy fiction, running up to the release of John le Carré's new novel in September. Part of the season is a series of talks in which authors talk about their favourite le Carré. Last night's was Nicholas Searle on Tinker Tailor Soldier Spy. I wasn't planning to go, as I haven't read any of Searle's books, but it turned out an acquaintance from the James Bond forum was visiting London from the US and would be attending, so I took the opportunity to say hello. We had an incredibly awkward I'm-looking-for-someone-is-it-you meeting which would have failed us both had it been a spycraft exam, then got a coffee and talked Bond while we waited for the event to start. I enjoyed the evening but soon realised I have forgotten everything that happens in Tinker Tailor, despite having seen the recent film...recently. Time to mug up on Absolute Friends, which I read at university and about which I remember absolute 0, before hearing Mick Herron speak about it in a fortnight's time. Afterwards, as we were debating purchase of Call for the Dead, a smartly-dressed gentleman with an umbrella approached and engaged me in conversation about the Cold War and the '60s. I started quoting 'Between the end of the Chatterley ban...' and he finished it for me, so presume I have now been earmarked for the Service. presume I have now been earmarked for the Service. Isn't Smiley supposed to be a tad on the irritating side? You were approached by Steed? Or are you going to be a Kingsman lol? Actually... He didn't prod you with the umbrella did he? I was on my guard for any umbrella-poking, believe me! And I still haven't seen Kingsman. I should fix that. I like Smiley - maybe because he is irascible.